Wildflowers in Albion Basin. Photo taken by Kiffer Creveling. Typically when you think of Alta, you are likely to think of skiing or hiking. 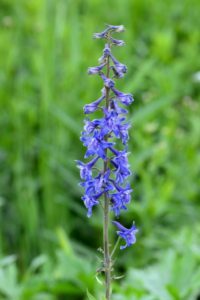 What most people don’t think about are the natural wildflowers that grow all over the area. 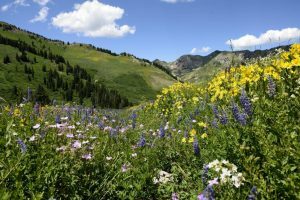 High-altitude wildflowers are some of the most rugged plants because of the environment they live in, residing in elevations near 8,500 feet or even higher. 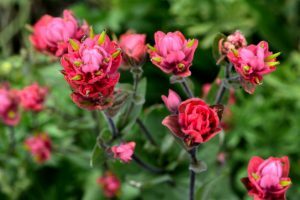 The blooming time of these flowers does not usually occur in the spring, but is instead delayed to the end of July, or even early August. 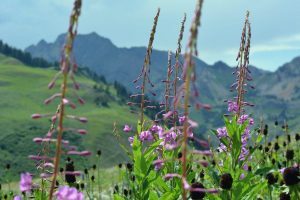 The Albion Basin wildflowers are something that everyone should have the opportunity to visit because of the uniqueness of those flowers. 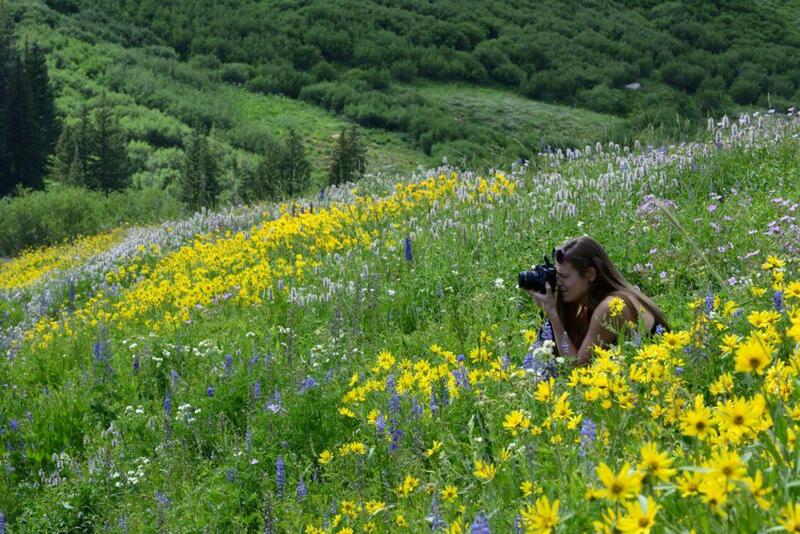 When you head up Little Cottonwood Canyon, you’ll begin to see the sea of flowers that flows around every canyon. Pay close attention to all of this, as the colors will change the higher up the canyon you get, as flowers of different elevations bloom at different times. Wide shot of wildflowers in Albion Basin. Photo by Kiffer Creveling. When you reach the top, where the Alta parking lot is, you can take the free shuttle that will drop you off on the Cecret Lake trailhead. It takes approximately 15-20 minutes between shuttles. The other option you have is to walk up to the trailhead through the Albion Basin meadow. If you are an ambitious hiker, then this is the option for you. You can walk next to the stream to see the flowers that need more water, which look completely different than the flowers in the meadows. Look carefully for the ground squirrels that have made their residence in the hills. Sometimes they’ll even peek out of their holes to ensure dominance over any approaching competition. Their presence makes the flowers even more fun to see. Bluebell wildflowers in Albion Basin. Photo by Kiffer Creveling. The bluebells and Indian paintbrush make up most of the blue and red flowers that you’ll see in the basin. The yellow flowers across the basin on the west side of the canyon make up the second largest meadow basin at Alta. The hike up to this meadow takes quite some time, but allows you to gain a new perspective of the Albion Basin flowers. Two of my favorite flowers to look out for are fireweed and elephant’s head. Fireweed is the faint purple flower that grows on tall green stocks that taper to the leaves. At the beginning of the summer at these high elevations, the flowers are near the bottom of the plant; as summer progresses, the flower blossoms move towards the top. Once the blossoms have reached the top, you know that summer has finished and that fall is near. Elephant’s head, on the other hand, looks just like what you’d think: a small pink flower that resembles the head of an elephant. It grows on a shorter plant that is typically located near water or a marsh. Fireweed wildflowers in Albion Basin. Photo by Kiffer Creveling. Remember as you go that the flowers are there to stay and for others to enjoy. Too many times you may see other visitors picking the flowers to make a bouquet. If you see this happening, kindly remind them not to do so. Forest rangers have put up informational cards on a few of the trees on the hike up to Cecret Lake, allowing young kids and the inquisitive hikers to learn about local nature in the area. On these cards you’ll read about the moose and the natural habitat, including the flowers surrounding you. If you are lucky enough on your walk to see the flowers, you may also be lucky enough to see a moose on the loose. Be sure to stay away and let them be — don’t disturb them. Make sure you take your camera with you to share the beauty of these wildflowers with others, without taking them away and harming the environment.